Should we let Michael O’Leary run our income tax system? Over the weekend, Ryanair boss Michael O’Leary took a stand on income taxes. He had two main points. Firstly, he said that high marginal rates (above 60%) encourage people like him to become tax exiles and so hurt, rather than help, the Exchequer. Secondly, he said that the income tax system should be simple. On the latter, he gave some more specifics. According to the Irish Independent, O’Leary said: “Anybody earning under €50,000 should pay 10 per cent tax. If you’re earning under €100,000, you pay 25 per cent and anybody earning over €100,000 pays 50 per cent. I’m one of the largest taxpayers in the country and I have no problem paying 50 per cent of my income in tax.” So how do his suggestions stack up? What’s not clear from that is whether he means a flat rate (i.e. someone earning €250,000 would pay 50% on all their income) or three marginal rates (i.e. that person would only pay 50% on income over €100,000). I’m going to assume he meant the latter, otherwise you would have the odd situation where workers earning €48,000 a year dread overtime or even worse a promotion as their tax bill would rise from €5,000 to €12,500 a year. One thing that is worth noting in passing is that even though we rightly think of housing bubble having come to an end in 2007 (or even late 2006), there is scant evidence of any hit in incomes as of 2008. There were 757,000 people earning €40,000 or more in 2008, compared to 640,000 in 2006 – indeed, the number earning more than €100,000 rose by 25% in the same period. It’s difficult, in that context, to be certain about what an income tax in 2011 (or realistically 2012) would raise, as we don’t know yet who’s been hit and by how much. Given all that, let’s compare instead the income tax system we had in 2008 with what Michael O’Leary’s three-band taxation system would have raised in 2008. First things first, the biggest change to the tax system is the abolition of tax credits. Anyone earning under €50,000 would pay 10% of their income over in tax – including, one would assume, those earning less than €15,000 who are currently paying only the Universal Social Charge. This would be a big culture shock for the vast majority of earners. Two years ago, I wrote about how the median earner in the country in 2006, earning €25,000, paid just 4% in income tax, compared to 20% in most other developed countries. By 2008, the median earner was taking home about €27,500 and still paying just 4% in income tax (this excludes PRSI, remember, which is insurance not tax). Even taking account of the health levy or, to make it more relevant to today’s earners, the Universal Social Charge, as is shown in the graph below, the average tax rates enjoyed by Irish earners up to about €50,000 are still well below the international benchmark of about 20%. What about Michael O’Leary’s system? That’s shown in red in the graph above. There are effectively three significant changes under such a system. Firstly, all those earning €30,000 or less would pay a flat 10% of their income over in tax, compared to 5% or less under the 2008 system and anything from 0% to 10% under the current system. Secondly, those earning more than €200,000 would see their average tax rate increase from about 34% now (including the USC) to 43%-51%. Lastly, those earning from €40,000 to about €150,000 would see relatively significant falls in their average tax rate. 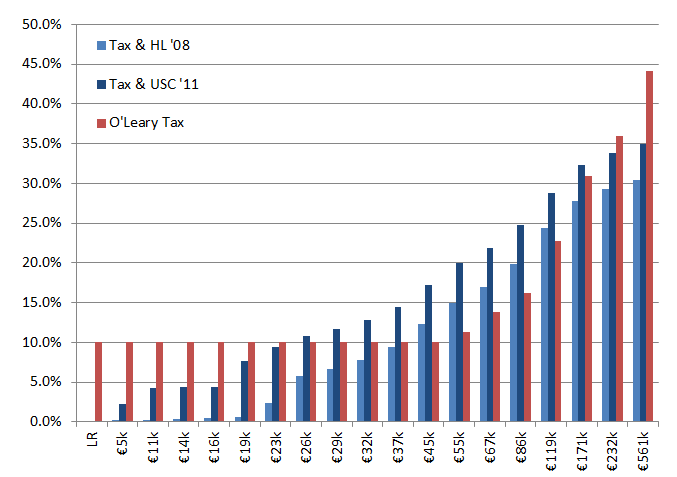 For example, the average amount of tax paid by those earning €60k-€75k is currently 22% (including USC) but this would fall to 14% under the O’Leary system. But would the Government be interested in such a scheme? It’s safe to say that the Government would only be interested if it resulted in more income tax coming in to the coffers. The 2008 system of income tax (and health levies) brought in about €13.9bn. Applying the 2011 system to the incomes earned in 2008 would have brought in €18.4bn, which is the benchmark for any new suggestions to beat. The straightforward “three marginal rates” system (with no USC) would have brought in €15.6bn in 2008. So it’s safe to say, for all its simplicity (and the unknown impact of that in creating new jobs), it’s not a runner. The reason so much tax revenue is lost is because of what happens the €40,000 to €100,000. Suppose O’Leary’s proposal was adjusted so that people paid 25% on everything earned between €25,000 and €100,000 (and 50% above that). Such a system would have brought in €18.6bn, based on what was earned then. I’ll suggest one more tweak. This would be to include all social welfare as taxable income – they are the people marked “LR” (Live Register) in the graph above. The primary aim of this measure is reduce the barriers to returning to work. Like every other developed country in the world, in Ireland someone who earns €10,000 should make some direct contribution in income tax. However, it’s simply not fair that someone earning €10,000 working has to pay tax while someone who receives €10,000 for not working doesn’t. And that lack of fairness affects people’s decisions. Such a revised system of income tax would face stiff political resistance, as although high earners would pay significantly more in tax, so would those who earn less than €25,000. Nonetheless, there are three principal benefits. Firstly, it would increase revenue to the Government. Secondly, it would create a simple and fair tax system, where everyone contributes and those who earn most contribute proportionately more. Lastly, it would demolish the artificial boundaries between money earned through various sources including social welfare. Most interesting article Ronan. Certainly the point made about paying tax on social welfare income, reducing barriers for re entry into the workforce. Increasing the incentive to work etc. However I feel you have left out one very important point. Regardless of the methodology used to collect income tax, the State has a duty of care to spend state revenue in a wise and prudent manner. This is a duty, it is a responsibility of the state. Regardless of the income tax methodology used, if the state is proving itself to be incompetent or just “too stupid” to be trusted with taxpayers money then only one option remains, go and live somewhere else. The culture of Zero Accountability by medical Consultants, by financial regulators by heads of semi state bodies has to be stamped out. Managers who earn large salaries have to be told in no uncertain terms that if they fail to do their job then they will lose their pension, lose their job, and be forced into bankruptcy and even stiff jail terms. There have been several disasters over the last two decades, from the hepatitus C scandal, to removal of womens wombs by a certain Doctor in Co Louth, to a recent Financial Regulator, various CEO’s of semi state bodies. In all these disasters the culture was “Sure who cares, the taxpayer will pick up the tab”. There is absolutely no deterrant in this country for a bad and reckless manager to change. The sad fact is that our political class does not realise this. Rewarding incompetence with large pay offs and fat pensions is nothing short of betrayal of the taxpayer. If I remember correctly, these kinds of options were considered in the 1980s Tax Commission. as I pointed out on p. 67 of the Dublin city Business Association 10 point manifesto published in February 2011 – just as the election campaign was starting. the system was not changed fundamentally. In 2009, yet another Commission on Taxation reported. · the taxation of development gains.